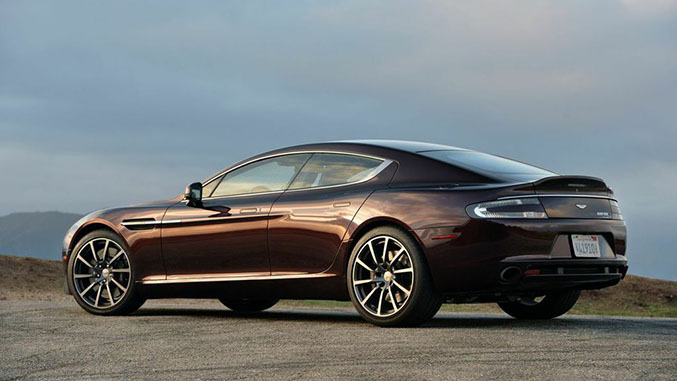 Today we’re at the helm of Aston’s V12-powered sports sedan. Externally 2015 might be misconstrued as a carryover year for the Rapide S, but the four door has received a host of tweaks this year that pay dividends behind the wheel. 2015 marks the debut of the new Touchtronic III eight-speed automatic gearbox, a transmission that’s been honed meticulously with technical partner ZF for use in the Rapide S and Vanquish. Here in the Rapide S, the new gearbox gets the Rapide S from zero to sixty miles per hour in 4.2 seconds - a full half second faster than last year’s model with the outgoing transmission - while also yielding an 11 percent improvement in fuel efficiency. Top speed of this four door grand tourer car is a blistering 203 mph. That new gearbox is mated to Aston’s venerable 6.0-liter naturally aspirated V12, which outputs 552 horsepower and 465 pound-feet of torque in the Rapide S. For 2015 a new Bosch Engine Management System has also been fitted to the car to refine communication between the powerplant and the new 8-speed gearbox. New rear bushings that are 20% stiffer than before, larger front brakes (400mm discs with six-piston calipers) and some subtle styling enhancements – including new ten-spoke forged alloys and new interior trim options – round out the changes for the 2015 model year.